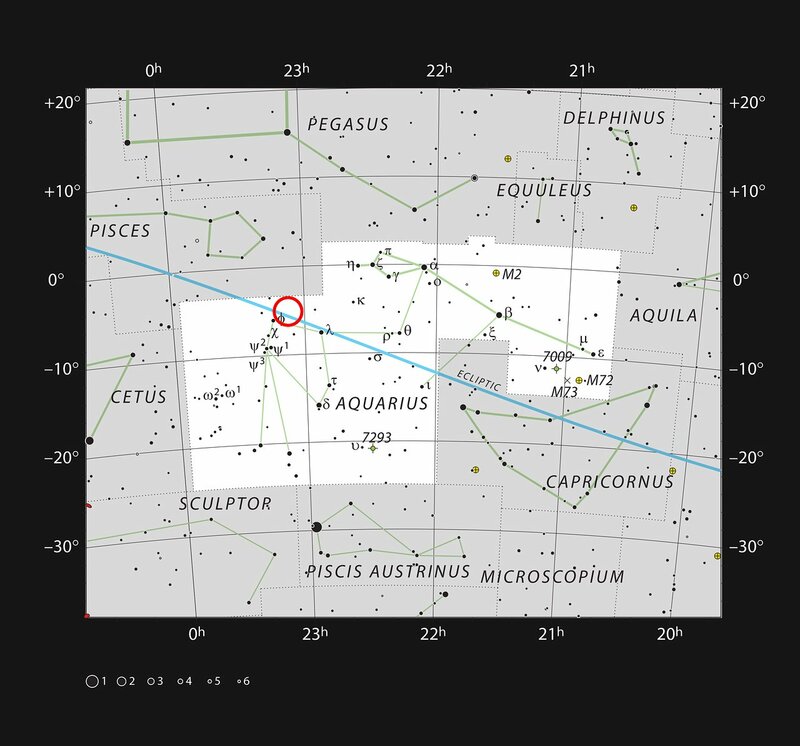 Planets around the faint red star TRAPPIST-1, just 40 light-years from Earth, were first detected by the TRAPPIST-South telescope at ESO’s La Silla Observatory in 2016. In the following year further observations from ground-based telescopes, including ESO’s Very Large Telescope and NASA’s Spitzer Space Telescope, revealed that there were no fewer than seven planets in the system, each roughly the same size as the Earth. 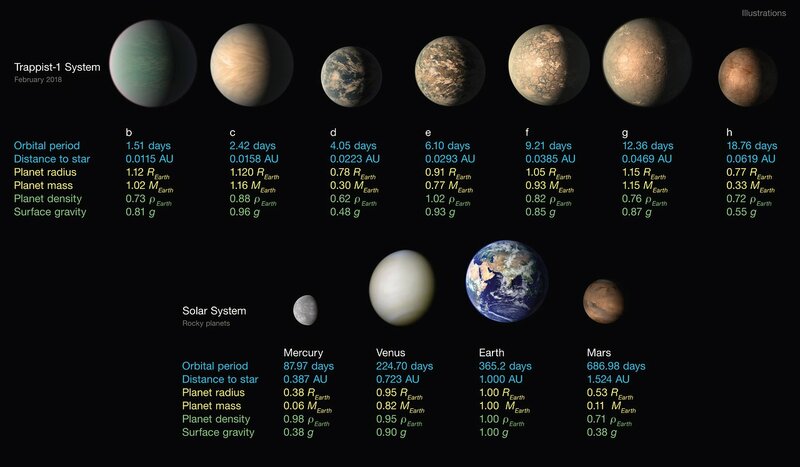 They are named TRAPPIST-1b,c,d,e,f,g and h, with increasing distance from the central star . Further observations have now been made, both from telescopes on the ground, including the nearly-complete SPECULOOS facility at ESO’s Paranal Observatory, and from NASA’s Spitzer Space Telescope and the Kepler Space Telescope. A team of scientists led by Simon Grimm at the University of Bern in Switzerland have now applied very complex computer modelling methods to all the available data and have determined the planets’ densities with much better precision than was possible before . 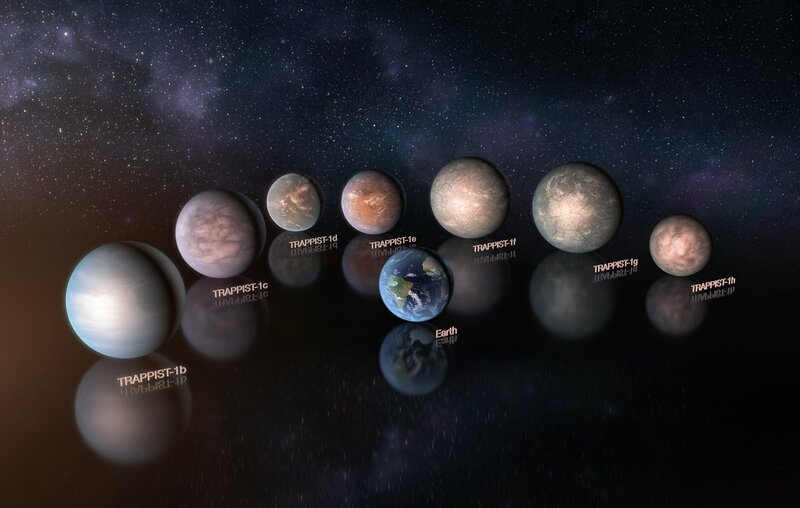 The measurements of the densities, when combined with models of the planets’ compositions, strongly suggest that the seven TRAPPIST-1 planets are not barren rocky worlds. They seem to contain significant amounts of volatile material, probably water , amounting to up to 5% the planet's mass in some cases — a huge amount; by comparison the Earth has only about 0.02% water by mass! 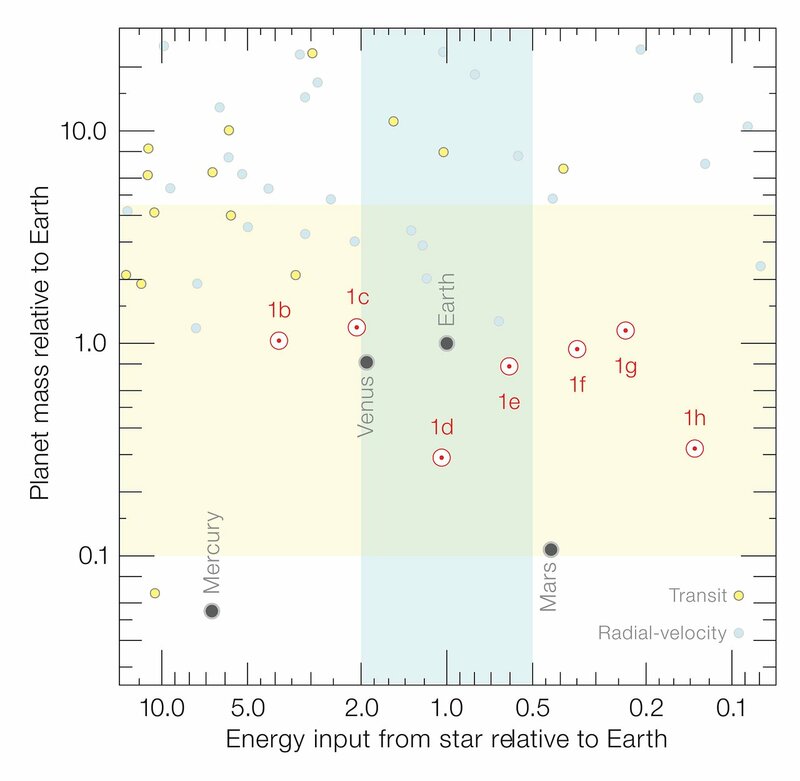 Measuring the densities of exoplanets is not easy. You need to find out both the size of the planet and its mass. The TRAPPIST-1 planets were found using the transit method — by searching for small dips in the brightness of the star as a planet passes across its disc and blocks some light. This gives a good estimate of the planet’s size. 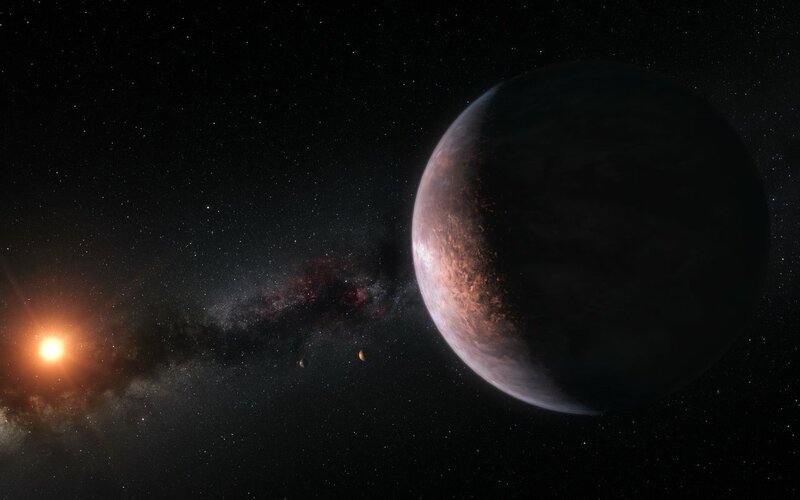 However, measuring a planet’s mass is harder — if no other effects are present planets with different masses have the same orbits and there is no direct way to tell them apart. But there is a way in a multi-planet system — more massive planets disturb the orbits of the other planets more than lighter ones. This in turn affects the timing of transits. 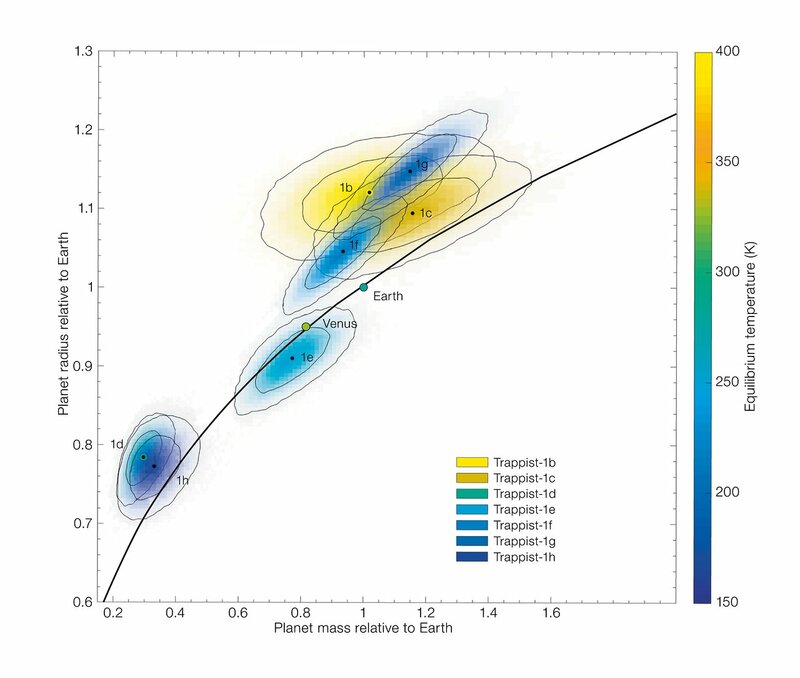 The team led by Simon Grimm have used these complicated and very subtle effects to estimate the most likely masses for all seven planets, based on a large body of timing data and very sophisticated data analysis and modelling. The models used also consider alternative volatiles, such as carbon dioxide. However, they favour water, as vapour, liquid or ice, as the most likely largest component of the planets’ surface material as water is the most abundant source of volatiles for solar abundance protoplanetary discs. The SPECULOOS survey telescopes facility is nearly complete at ESO’s Paranal Observatory. 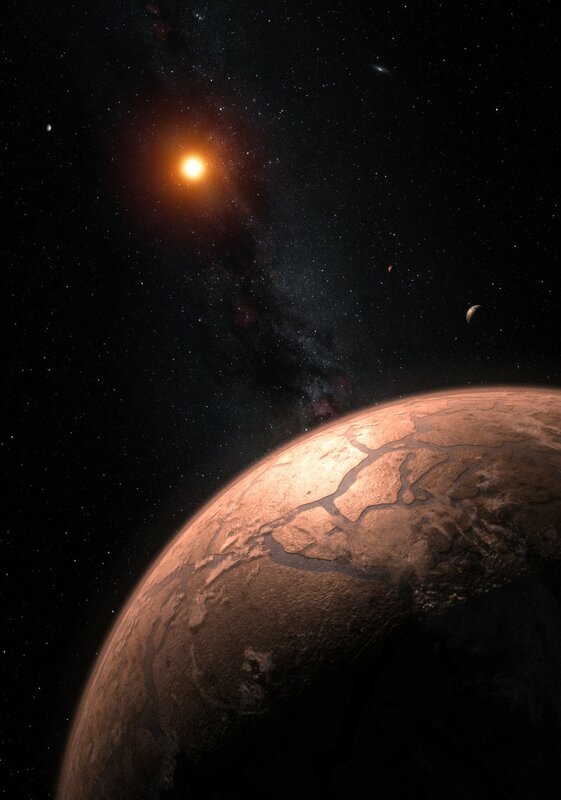 This research was presented in a paper entitled “The nature of the TRAPPIST-1 exoplanets”, by S. Grimm et al., to appear in the journal Astronomy & Astrophysics. 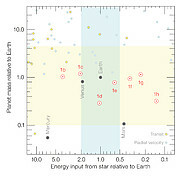 The team is composed of Simon L. Grimm (University of Bern, Center for Space and Habitability, Bern, Switzerland) , Brice-Olivier Demory (University of Bern, Center for Space and Habitability, Bern, Switzerland), Michaël Gillon (Space Sciences, Technologies and Astrophysics Research Institute, Université de Liège, Liège, Belgium), Caroline Dorn (University of Bern, Center for Space and Habitability, Bern, Switzerland; University of Zurich, Institute of Computational Sciences, Zurich, Switzerland), Eric Agol (University of Washington, Seattle, Washington, USA; NASA Astrobiology Institute’s Virtual Planetary Laboratory, Seattle, Washington, USA; Institut d’Astrophysique de Paris, Paris, France), Artem Burdanov (Space Sciences, Technologies and Astrophysics Research Institute, Université de Liège, Liège, Belgium), Laetitia Delrez (Cavendish Laboratory, Cambridge, UK; Space Sciences, Technologies and Astrophysics Research Institute, Université de Liège, Liège, Belgium), Marko Sestovic (University of Bern, Center for Space and Habitability, Bern, Switzerland), Amaury H.M.J. Triaud (Institute of Astronomy, Cambridge, UK; University of Birmingham, Birmingham, UK), Martin Turbet (Laboratoire de Météorologie Dynamique, IPSL, Sorbonne Universités, UPMC Univ Paris 06, CNRS, Paris, France), Émeline Bolmont (Université Paris Diderot, AIM, Sorbonne Paris Cité, CEA, CNRS, Gif-sur-Yvette, France), Anthony Caldas (Laboratoire d’astrophysique de Bordeaux, Univ. Bordeaux, CNRS, Pessac, France), Julien de Wit (Department of Earth, Atmospheric and Planetary Sciences, Massachusetts Institute of Technology, Cambridge, Massachusetts, USA), Emmanuël Jehin (Space Sciences, Technologies and Astrophysics Research Institute, Université de Liège, Liège, Belgium), Jérémy Leconte (Laboratoire d’astrophysique de Bordeaux, Univ. 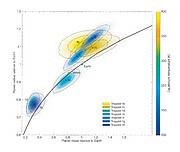 Bordeaux, CNRS, Pessac, France), Sean N. Raymond (Laboratoire d’astrophysique de Bordeaux, Univ. Bordeaux, CNRS, Pessac, France), Valérie Van Grootel (Space Sciences, Technologies and Astrophysics Research Institute, Université de Liège, Liège, Belgium), Adam J. Burgasser (Center for Astrophysics and Space Science, University of California San Diego, La Jolla, California, USA), Sean Carey (IPAC, Calif. Inst. of Technology, Pasadena, California, USA), Daniel Fabrycky (Department of Astronomy and Astrophysics, Univ. of Chicago, Chicago, Illinois, USA), Kevin Heng (University of Bern, Center for Space and Habitability, Bern, Switzerland), David M. Hernandez (Department of Physics and Kavli Institute for Astrophysics and Space Research, Massachusetts Institute of Technology, Cambridge, Massachusetts, USA), James G. Ingalls (IPAC, Calif. Inst. of Technology, Pasadena, California, USA), Susan Lederer (NASA Johnson Space Center, Houston, Texas, USA), Franck Selsis (Laboratoire d’astrophysique de Bordeaux, Univ. Bordeaux, CNRS, Pessac, France) and Didier Queloz (Cavendish Laboratory, Cambridge, UK).